Today’s day 20 in our month long National Craft Month Giveaway. Come visit our blog every day to enter to win a different prize of the day. Find the contest rules and enter below. Today’s featured project is from AllFreeChrismasCrafts. Christmas paper crafts are fun and simple. Don’t believe us? 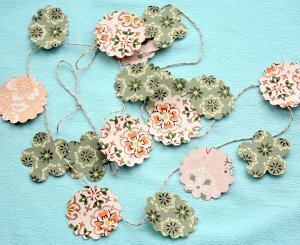 Take a look at this Punched Paper DIY Garland. In just a few short steps you can create darling DIY garland to string throughout your home or around your Christmas tree. 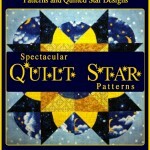 Be sure to check out more projects in the 18 Projects Every Crafter Wants free eBook. Celebrate National Craft Month with us by crafting the great projects in this free downloadable eBook written just for you! Today’s prize is a bundle of paper crafting supplies. Includes in this prize: 4 packs of Mod Podge Podgebale Papers, Darice Hemp Cord, Darice Sparkle Tape, 2 David Tutera Self-Stick Shimmer Sheets, 1 set of David Tutera 24 piece Tags, Tulip Sparkle Beads in a Bottle, Tulip Neon Dimensional Fabric Paint, Tulip Fashion Glitter, 2 Washi Masking Tape Rolls, Aleene’s Turbo Tacky Glue, 4 Plaid Folk Art Stencil Sheets. Have you ever made a garland? 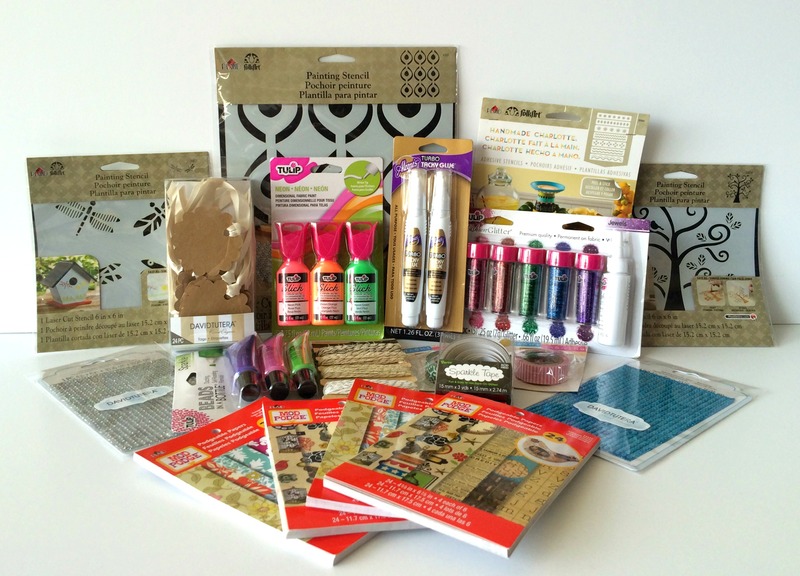 Don’t miss your chance to stock up your craft stash and win more than $2,000 in crafty prizes! There’s something for everyone in this epic craft giveaway…trust us, you don’t want to miss this one! You can enter to win this awesome assortment of prizes once a day throughout the month of March. You must “like” the AllFreeChristmasCrafts Facebook to be eligible. You have until tonight, March 28th, 2014 at 11:59p EST to leave your comment on this post. Comments posted after that will not be counted. No, but I’ve thought about it a lot. Not yet, but I would like to. I have made garlands, and love the look of them. They are fun year round. Have made a yarn garland – so fun ! I have made Christmas garland. Love to scrapbook. Yes. For our christmas tree.Made a red and green paper chain. Yes, I am making a new one right now for my vintage camper. It has stars in the burgundy and golden colors that my camper is decorated in. One year I saved all the lids from empty milk jugs (with 3 kids on WIC at the time, we had a lot of milk). I used hot glue to space them about 1 1/2 inch apart on 1/4″ ribbon. Then I used different colored squares of tissue paper and iridescent craft cellophane (for wrapping baskets and gifts) stacked together to wrap each lid to look like candies. There were over 18 feet of strung “candies” on our Christmas tree for several years. 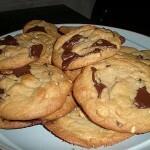 They turned out so good that when my son was about 3, he found them in a box after we moved and thought they WERE candy. He unwrapped about a dozen before I caught him. Yes, I have made a garland. Mostly they have been for Christmas but a couple of other occasions too. Yes, I have made garlands twice – ones for my cousins wedding (as in india the bride and groom put flower garlands around each other’s neck); and second – for my house door during a festival (diwali) in india. Now I am working on one for my house in Aberdeen. 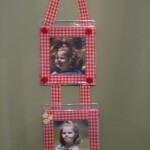 Would love to win this giveaway use the wonderful things in my garland! Haven’t made one in years, but using paper like this would be really cute. I just recently made a paper one for a baby shower. It turned out really cute and I will make more. I have made paper garland, and popcorn garland. I also bought picks and hot glued them to garland, I would also like to try to make them with twisted with lights. I bought one with Christmas presents and bows all in different colors and patterns. I put it in a large sleigh, and put a Santa bear in the sleigh ( it looks really cute ). I would love to make one for my Grand daughters baby shower. yes, I love making garlands for all holidays! I haven’t made garland since my son was little (now he’s 20) I think it’s time I do it again, this time in a more fancy way. Yes, I have made garland out of all sorts of things and for many reasons. I have made garland using paper, wide ribbon and mounted baby photos for a first year birthday party and also a burlap stamped pinny for a wedding shower. This type of banner is so versatile. Thanks for a great prize offering. I have made a Christmas snowflake garland and valentine hearts garland with my 2 year old. She enjoys projects so I’m sure we will do many more!